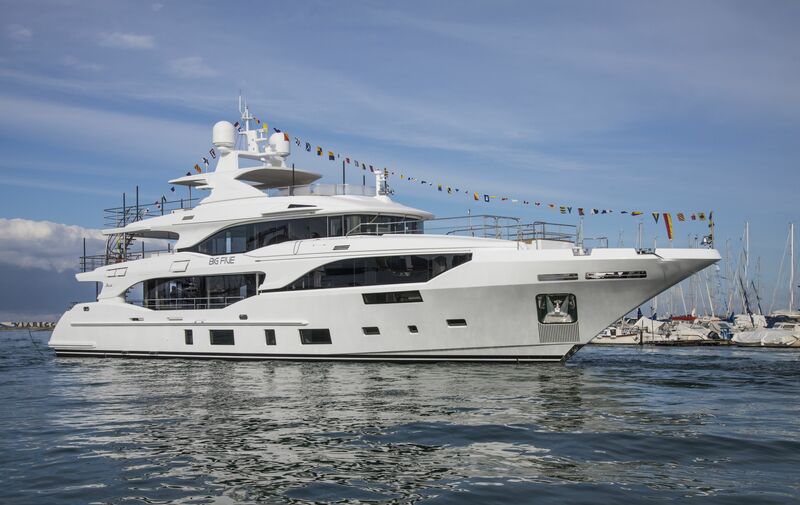 On March 28, in Livorno, the Shipyard celebrated the christening of 108-meter giga yacht FB275, following closely on the heels of the March 21 launch in Viareggio of BD105, the fifth unit of the elegant and classically styled 29-meter Delfino 95. The generously spaced and welcoming interiors of the yacht are decorated with innovative combinations of marble, polished brass inserts and ash, eucalyptus and tay wood, creating an interesting alternation of textures and colour tones. The exteriors designed by Giorgio M. Cassetta provide a cue for interesting plays of light in the interiors through extensive glazed surfaces. The owner’s cabin on BD105 has a bed adorned with sophisticated leather-upholstered headrests and a spacious bathroom fitted with tub, shower and mini bar. The two 1,000 hp Man V8 engines provide a range of about 2,400 nautical miles at a cruising speed of 10 knots. And when time is of the essence, the yacht has a top speed of 14.5 knots.